Liner Feutre by Bourjois. Eyeliner pen. Intended for eye underlining and eyelash line. Equipped with a precise applicator, Easy to use. It easily allows you to create lines of different thicknesses. 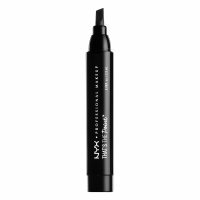 The fast-drying, long-lasting formula has an intense shade. The product is available in black 11 Noir. It has a long-lasting, non-dispersing formula.